Thursday, January 7th, 2016 at 3:24pm. The internationally renowned fashion designer Philipp Plein has moved his company headquarters to Lugano and is therefore leaving his Swiss home in Amriswil. He had the art nouveau mansion lavishly refurbished in 2010. The property is now on the market fully furnished for the equivalent of approx. 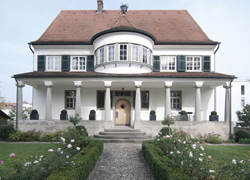 3.9 million euros through Engel & Völkers Kreuzlingen in Switzerland.